Soon after news broke about the Cobrapost sting operation on Paytm which revealed that India’s largest and presumably most-trusted digital payments company may have leaked the data of many users on the command of the Prime Minister Narendra Modi’s Office. The story, which obviously caught on like wildfire on social networks, resulted in many people urging others to delete their Paytm accounts. Pointing out the breach of trust at the behest of the government, enraged users got the “#DeletePaytm” hashtag trending around India. While Paytm has been in denial mode, many other users have urged the Reserve Bank of India to intervene in the issue and take strict action against the company. Some others have also recalled the dreadful state of Aadhaar security. 200 milion #PayTM data is chicken feed compared to the 1.2 billion #aadhar data that's gone to #BJP offices. 1.2 billions Indians will start getting customised WhatsApp, FB, Twitter, Li, Instagram, Snapchat messages and emails & SMS by end of the year. 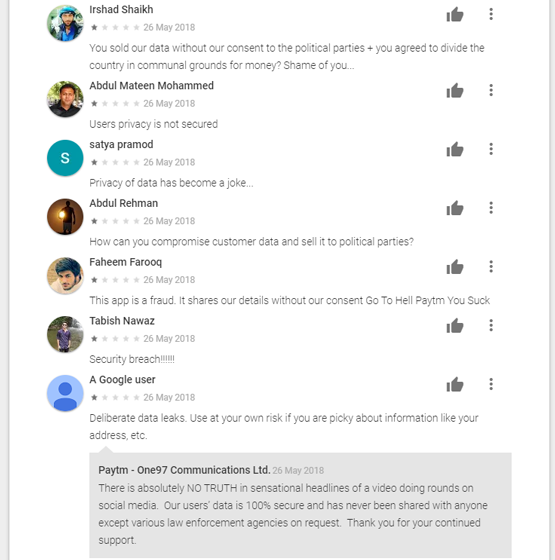 Because of the political implications – Paytm’s VP said the PMO called the company soon after riots and stone pelting in Jammu and Kashmir, the situation has also been compared to Cambridge Analytica and Facebook. Given Paytm’s stance on WhatsApp Payments and the fact that founder Vijay Shekhar Sharma called Facebook the most evil company in the world, the Cobrapost investigation is tinged with irony. Paytm’s Android app also suffered as a result of the investigative report. The app has received a number of 1-star ratings in the past 24 hours, along with reviews that point out the company’s involvement with the PMO in communal issues. Many other concerned users have also echoed the need for a GDPR like regulation in India that gives users complete control over their data, with independent bodies backing such a policy. However, given the government’s involvement in this case, this is not likely to lead to regulatory changes any time soon. We are intrigued by the notion of the PMO making personal calls to Paytm’s VP or upper management. If true, this would be the grossest abuse of power in violation freedom of privacy. It’s not yet clear whether the PMO or the Indian government has asked Paytm to hand over data of users in other situations. Paytm is India’s largest digital payments company, and became a household name after the ill-planned demonetisation of November 2016. The government’s push for cashless banking meant Paytm was one of the first digital payments services to gain from the demonetisation move. Paytm even released front page ads in leading national dailies with Modi’s image and thanking the PM for the demonetisation that supposedly modernized payments in India – even though over 100 Indians actually died as a result of the move. But, as we have seen in the case of #DeleteFacebook campaign that ran lukewarm and died out without Facebook drastically losing users, there is a chance that this campaign runs dry. One thing that the Indian citizens have the right to demand is a legal trial and suspension of Paytm’s services if the allegation is actually true. Senior Vice President of PayTM reveals his deep relations with RSS and BJP ministers. The news also contradicts the allegations made by Paytm founder Vijay Shekhar Sharma about other rival services trading users’ data and sending it back to their home countries.